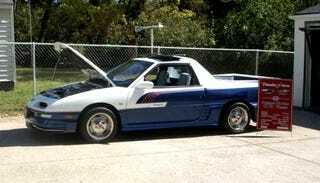 As much as we may be inclined to mock the Thunderstorm, which combines the nose and a powertrain of a Geo Storm with the rear end of a Subaru Brat and was constructed with an impressive level of parts-bin rummaging, we're in awe of how cool it actually is. The Thunderstorm is up for sale due to the "RECENT PASTING" of the seller's deceased "BELOVED HUSBAND" and has the lineage to prove it. Designed by someone in Alabama, the curiously-named Thunderstorm is a rolling metaphor for 1990s GM: Geo headlights, Isuzu engine, Cavalier bow ties, Subaru rear end. The Stormamino has less than 38K miles and, for a car that's mostly Japanese, a patriotic paint job. Bidding starts at just $9,999. Seller description with a list of the 20 cars that went into making this impressive amalgam below the jump.